KawaiiPunk - Kawaii Mascot Blog: Embellish Yourself! And Blythe! Get ready everybody, it’s time for a tasty treat! No, I’m not talking about myself, although I do co consider my posts to be the tastiest around :) I’m talking about a crafty treat. A crafty Etsy treat, if you must know! Today we’re going to be looking at the amazingly cute work of a shop called Embellish Yourself. Embellish Yourself is a slice of crafting cuteness that specialises in lampwork glass bead jewellery. Its range of super cute necklaces include designs featuring Teddy Bears, Apples, Flowers, Kitty Cats, and much, much more besides! But the best is still to come! As well as being able to pick up a tasty treat for yourself, you can also get one for your Blythe doll too! That’s right! 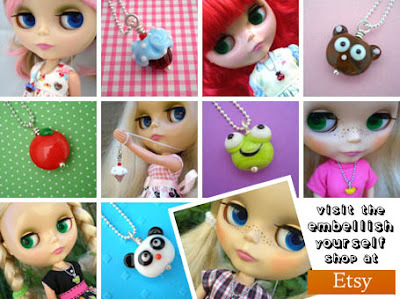 Embellish Yourself also sell jewellery for dolls! Well… I did tell you this was going to be a tasty treat, didn’t I? Thank you so much for featuring my shop. It's wonderful!